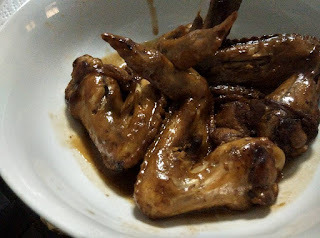 Nana Patricia | ♥Where ideas come to life♥: Cola Chicken Wing - the non-grilled BBQ alike chicken wing! Cola Chicken Wing - the non-grilled BBQ alike chicken wing! erm ... is this photo looks tempting to you? are you mean by this Cola? Ah ha .. ya ya , this Coca Cola is what i meant ! This dish is a little bit sweet but it taste good! Here you go, the recipe! 1. Put in olive oil and ginger slice , stir fry. 2. Put in the chicken , fry till golden brown . 3. Pour in one can of Coca-Cola (enough to cover the chicken). 4. Cover with lids and simmer till the sauce is thickening.